Eight days past the disaster, locals have taken it upon themselves to aid the needy, conducting relief and rescue operations to manage shelter and foodstuffs in the district. Locals of two municipalities and a dozen VDCs located in the hilly region of the district have been severely affected by the quake leaving them high and dry. 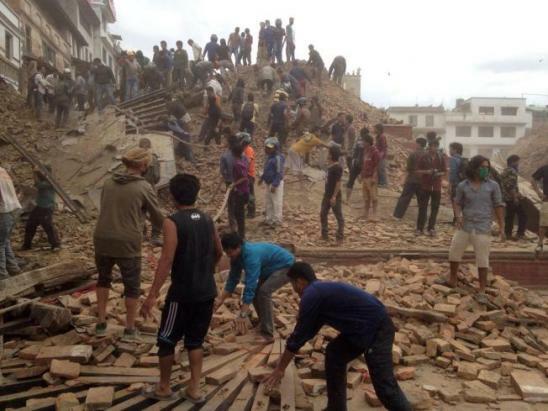 Despite aftershocks being felt at frequent intervals, locals, in a collective manner, have started rescue operations. Dil Bahadur Dhalan, 68, of Tistung-6, rescued three hours later by locals from under the rubble of his two-storey house has been mentally traumatised and is in a state of fear. “I was saved from the jaws of death by neighbours,” said Dhalan, expressing his gratitude. Locals also managed to rescue five-year-old Sabita Dhalan of Tistung-7, listed among the dead, 20 hours past the quake. Traumatised, the minor does not speak much. Locals in the area said that they intend to start repair and reconstruction by themselves if the government fails to address their problem. “As it is impractical to live under a tent forever, we have to reconstruct our house,” said Sahila, father of the rescued minor. Five hundred thirty four houses have been destroyed by the quake in Tistung, with 99 percent of its population comprising of people belonging to the Tamang community. In the absence of relief materials from government authorities, locals have been living in groups under makeshift structures made out of timber and corrugated metal sheets. The quake had claimed four lives in the VDC. Locals including representatives and activists of local political parties, local organisations and District Disaster Management Committee have been putting in their level best in rescue and relief operations.